Developed in conjunction with the world's top stackers, they include special features and are approved by the WSSA for competition use. Available clear, they also feature the patented Quick Release stem. 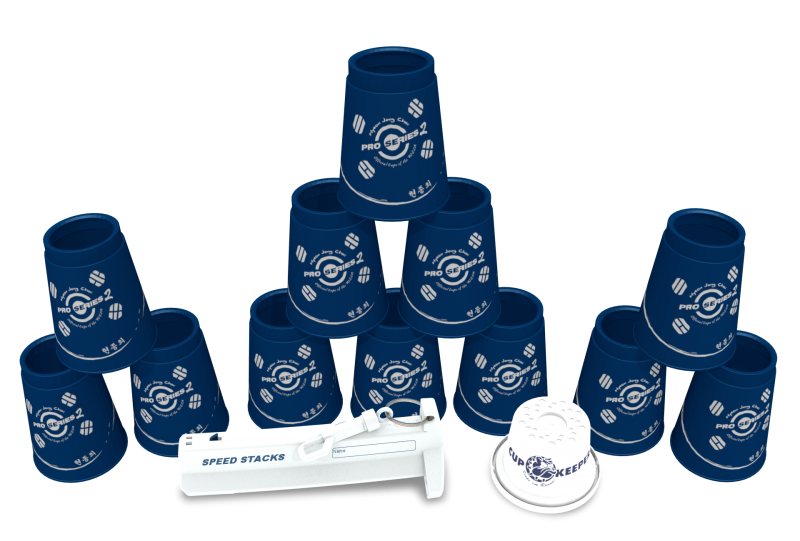 Speed Stacks just brought in Si Eun Kim Clear Pro Series 2. I feel like this is good, because now people can have a chance to get their hands on Clear Pros. Although, I do not want William Orrell Pro Series to go out of stock, as I love those cups as a backup. Here are my thoughts on the SEK Pros. Overall, I would highly recommend these cups! Worth the price. The new Si Eun Kim Pro Series 2 cups are awesome. They are really transparent and feel really nice. The upstacks are smooth but the downstacks need to be worn in. These cups are awesome! They have helped me boost my speed, but I'm not very consistent with them. They are kind of too thin and they slide easily. But the up stacking I can see is better than any other set I've tried. Great cups. I recommend them. 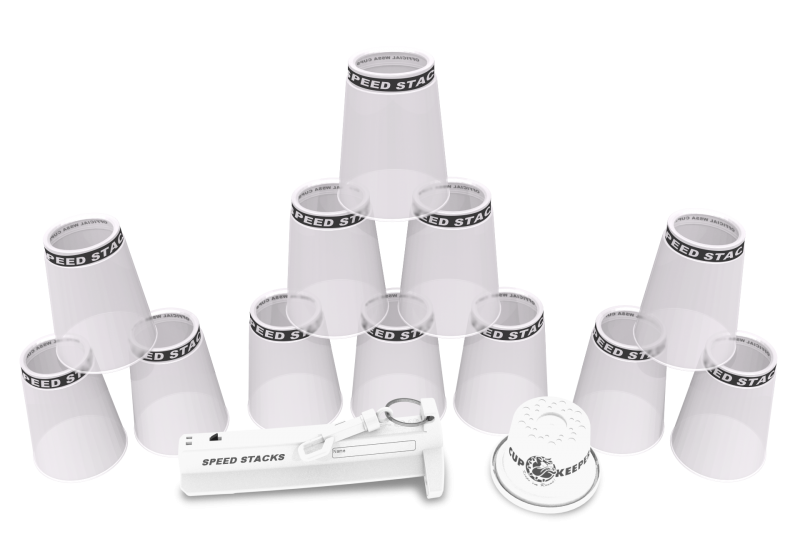 I'm so glad speedstacks brought back Clear Pro Series 2! These cups are so amazing and I cannot wait to break more records with them. Even if you are reading this and clear pro series 2 aren't available, pick up the latest pro series 2 available because they are awesome and a must have for every stacker! I absolutely love these cups!!!!!!! I would reccomend them to anyone. However, the only downside is that after a while, the cups are hard to downstack. If you wash them though, there fine. But other than that, GREAT SET!!!!!! up a page and that page will tell you how your time ranks with the city,state,country,world which is really helpful and it helps you improve your score.Information -When I bought the william Orrell pro series cups they said they were going to take 3-6 days to ship,But they came in 2 days. cons-The only thing that I do not like about the website is there are not a lot of reviews on the website,But since it is the official website there equipment is very good quality, so,would not worry about that. I got my first stack of cups there and they have lasted a long time if you use them every day they should last a couple of years I have had mine for 2 years,and they have not broken. 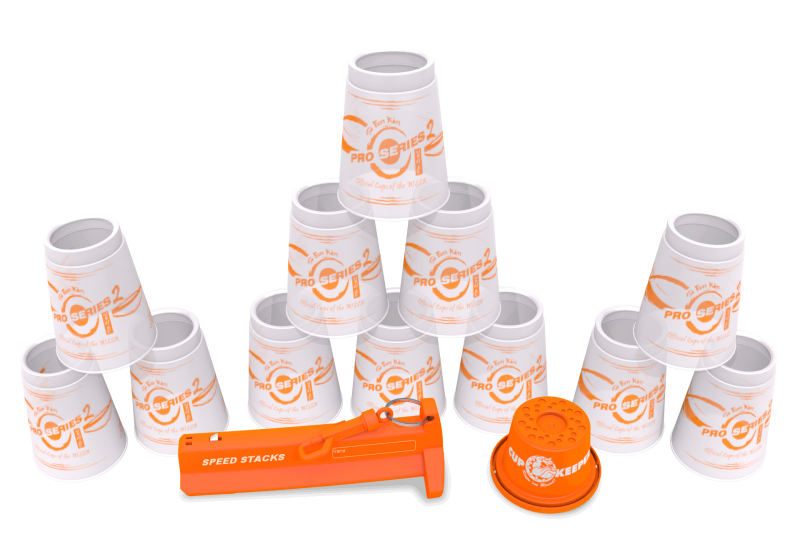 Overall the store is very good and it has good quality equipment ,and I would recommend the store to anyone who wants to start sport stacking. These cups are totally awesome. I beat my record try after try with these cups. I went from 7.111 seconds to 6.768 seconds in one try. I was SO excited. When I first got them (at Christmas), I didn't know about the squeak-proof method, which was why I was very slow at first. Then, after I found out how to make them not squeak, my time was shooting downward. I am very proud to own these cups. Way to go speedstacks!!!!! He has spent many - many hours speed stacking starting in the 3rd. grade. He is now 15 still competing. This sport has brought him a great feeling of accomplishment and enjoyment. these cups are the best set that i have got the down stacks are very good and for the 3-3-3 I got 1.976 my PB then for the 3-6-3 I got 2.646 my best then for the cycle 7.642 my personal best so overall they are just amazing. These Cups Are So Awesome! I Already Got A 5.788 Which Is My 2nd Best In The Cycle. They Are Not The Best Set But They Are A Good Set To Use At Competitions. These are the best cups ever! This Is The Best Set I Have Ever Gotten! These Are One Of My Favorite Sets! These Are One Of My Favorite Sets Because It Is More Easier To Upstack And Downstack With No Fumbles Like My Blues. These Are The Best. These cups are the best ever! I've been stacking for 6 years and these cups are the easiest and lightest I've used yet. They are at a fair price, they are worth way more than what you pay. 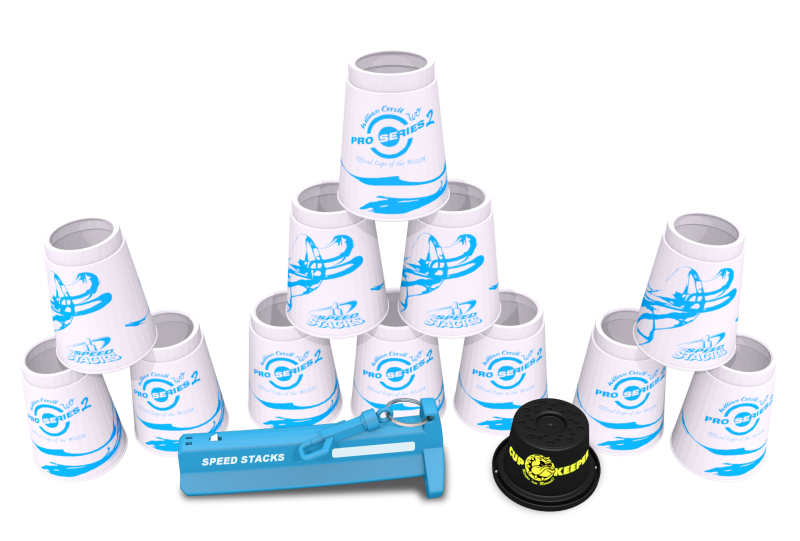 From just learning to stack to breaking the world record these cups are for any level! They are a must have. If you're looking for new cups without a doubt get these! Unbelievable cups! With these I have my 3-3-3 personal best 1.619 and cycle personal best 5.525. 3-6-3 I\'m close with 2.062 my record is 2.032! These are a must have! Wow!!!!!!!!! With these cups I've gotten 3-3-3 1.619 (my current record), 3-6-3 2.062 (my current record is 2.032) and cycle 5.547 (my current record). Get these cups! They take about 30 min.-1 hour to get broken in. But then they are amazing and only get better from there! With these cups I have gotten 3-3-3 1.619 my current record. 3-6-3 2.062 my 2nd best. Cycle 5.547 my current record! These cups are Amazing!!!! These cups are amazing. I\'ve gotten 2/3 of my personal records in them and I have the Fastest on the web for 3-3-3 with them with the time of 1.394. I would recommend these cups to anyone. These cups are amazing! I am getting really good times for these in all events. I'm also do really well in tournament with these. I stack about 7-9 hours a week and use these cups 90% of the time. They are light weight and good with down stacking. For those of you who are new to stacking and are not sure what to buy, get these. They are a great set for stackers just beginning, to the best stackers! They are amazing! These are amazing! I tried them out at my local toy store and they are insanely fast! they are AMAZING i got almost all new best in tournament with them at my last tournament! they can be really hard to downstack when you first get them but thats no big deal since most cups are like that when you get them. These are very high quality cups, they look good, "smell" good and, they preform very well because of there huge holes and quality plastic. it was such a good idea to get this new tipe of cup. fast,non sticky and reliable!!! I've been stacking since kindergarten. I've been on my school's team for each year and have seen my stacking get faster and faster. My teacher teaches a 2 week unit every year and makes sure that our class of 40 to 60 students learn and have cups to use . We have all improved each year.